What to do with leftover steak is a frequent dilemma for we grillin' folks. We put a lot of love into creating a great steak, but we (at least I) almost always tend to go a little overboard. Here's something that I've recently come up with to make good use of leftover steak. It's quick, easy, hearty and good. Quesadillas are a great quick and easy way to use leftovers. They are basically a thin crust mini-pizza with a lid, so stuff them with what you like and enjoy. Grilling them adds a great added depth of flavor. For these I used leftover flat iron steak, onions, green peppers, cremini mushrooms, and a heavy dose of provolone cheese. If you don't have any leftover steak, just use some good deli roast beef. Start your grill and prepare for direct cooking at medium heat (300-350º). Heat a medium saute pan over medium-high heat, add the olive/canola oil, and let heat for 30 seconds. Add the peppers to the pan and saute for two minutes, stirring/tossing frequently. Add the onions to the pan and continue cooking for two minutes, stirring/tossing frequently. Add the mushrooms to the pan and continue cooking for three minutes, stirring/tossing frequently. Add the garlic salt, beer, and hot sauce to the pan and continue to cook for two minutes. Add the meat to the pan, stir, remove from the heat, and set aside. Lightly oil one side of one tortilla with the spray and lay it oiled-side-down on the backside of a sheet pan. Arrange half of the cheese slices on the tortilla, leaving about one inch margin near the edges. Spread half of the meat and veggie mixture over the cheese, maintaining the margin. Lay another tortilla (un-oiled) on top of the meat and veggie mixture. Arrange the other half of the cheese slices on the tortilla, leaving about one inch margin near the edges. Spread the other half of the meat and veggie mixture over the cheese, maintaining the margin. Lay the third tortilla on top of the meat and veggie mixture, and spray the top lightly with oil. Gently slide the quesadilla off of the sheet pan and onto your grill. Grill until the edges of the bottom tortilla just start to brown. Gently spin the quesadilla one-half turn, and continue cooking for about another minute. Using a large spatula, gently flip the quesadilla over and repeat the same grilling process as the first side. 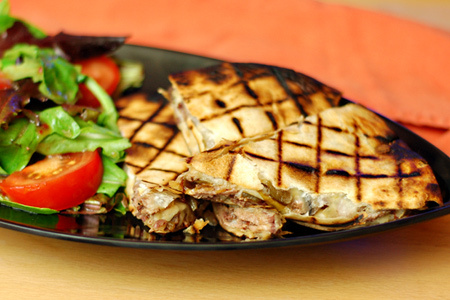 Remove the quesadilla from the grill and let it rest for five minutes. Slice like a pizza, serve and enjoy! Thanks, John. I appreciate your kind comments. Leftover steak? I'm not familiar. this sounds really good, gonna give this a go, thanks for sharing.